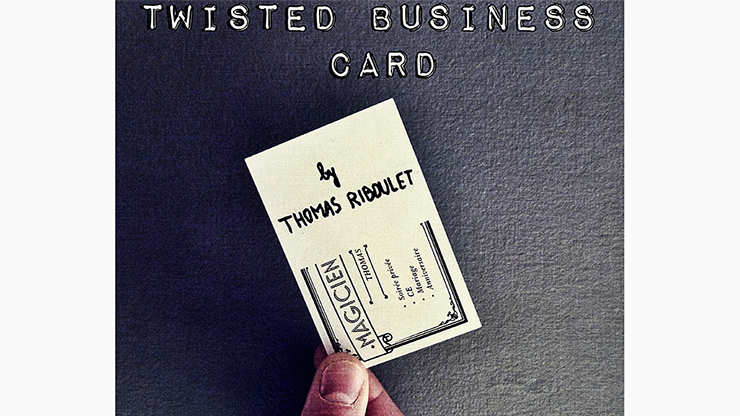 Twisted Business Card is a fresh new approach to the Torn and Restored Card. Throughout history, magicians have performed their magic during weddings, birthday parties or company meetings. After their final effect, what happens now? A last trick? Simply leave a business card and hustle out the door? Today, I'm proud to share my idea for your finale, which allows you to give out your business card in an impossible and magical way. And you can be sure that the spectator will keep your business card! Tear your single business card in two. Place the two halves together and restore it. This is a great way to give your business card and freeze this moment in time. And of course, the card is signed and examinable. If you are looking for hard hitting visual magic that leaves your spectators amazed, bemused and with an incredible conversation-piece souvenir, then Twisted Business Card could be exactly what you need. This leaves the spectator with an incredible souvenir that they will keep and talk about forever. The effect can be straight and to the point or you can use an 'Anniversary Waltz' style presentation. This is an incredible version of the Torn and Restored plot that you will look forward to performing in any conditions. WARNING: Twisted Business Card comes only with an explanation video. Business cards are excluded. This is so you can design your OWN business card. But don't worry, a tutorial video to design your card is available in the download. 100 cards will cost approximately $25 (25 cents per performance), and Thomas will help you with the design and where to purchase what you need.